← Installerstore.com Memorial Day Weekend Super Sale!! Here at Installerstore, we have a wide selection of Do-it-Youself Products and Humorous Door Mats that work as a perfect gift for any dad or grandfather. Some welcome mats are even themed such as our golf and fishing mats. Most humorous door mats are in stock, and take about 1-2 business days to ship out. Express shipping is also available for those to wait till the last-minute! Call for more information 866-258-1554. Caption- "I Golf. Therefore I Am Not Here"
Caption- "To Fish, or not to Fish? What a stupid Question." 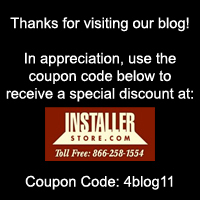 Visit us at Installerstore.com to view our full line of registers, caulking, cleaners, and much much more!